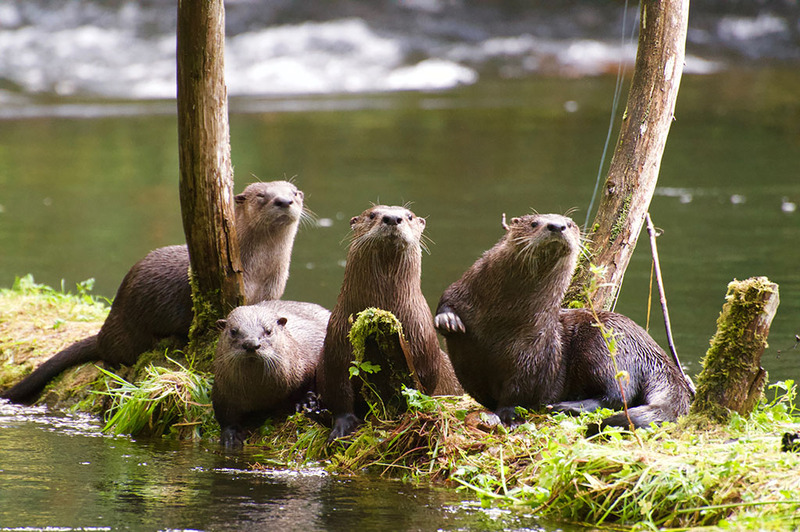 Kristen Walters is a M.Sc Candidate in the Centre for Wildlife Ecology research group at Simon Fraser University. 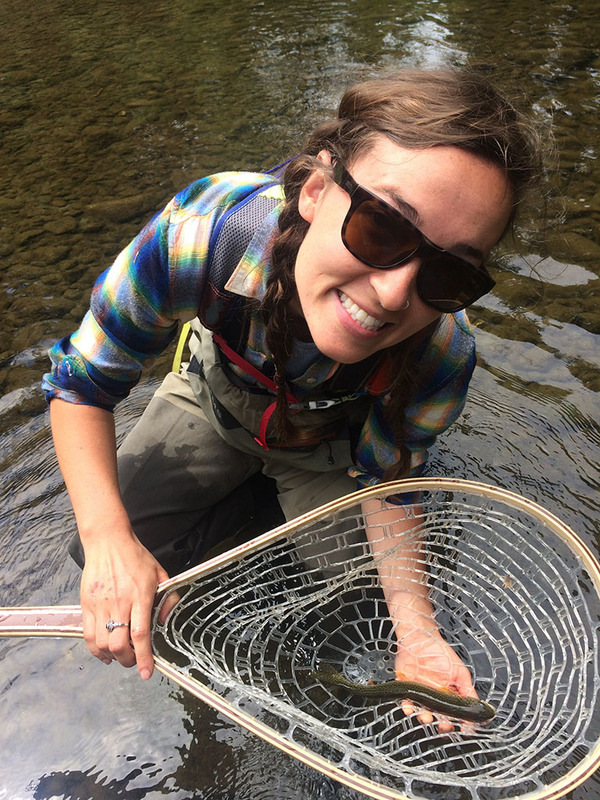 She is a predator biologist that is currently studying predator-prey interactions in salmon watersheds, with a focus on examining the role bald eagles play as nutrient vectors in transporting marine-derived nutrients from the sea to the land. Her background includes a B.A from the University of British Columbia, where she studied both the arts and sciences. She is originally from Wyoming, where she grew up surrounded by the Greater Yellowstone Ecosystem, which boasts healthy populations of large predators like wolves, bears and mountain lions. She was inspired from a young age to pursue wildlife conservation, and has been fortunate to study apex predators, particularly big cats, from Wyoming to South Africa to India. Since her big cat days, she has transitioned her research focus to avian predators, like the bald eagle, and their unique role our coastal ecosystems. Kristen got connected with David Hancock through Dr. John Richardson, who was her mentor at UBC. She has been collaborating with David H. on her Masters research, along with other ornithologists at SFU. 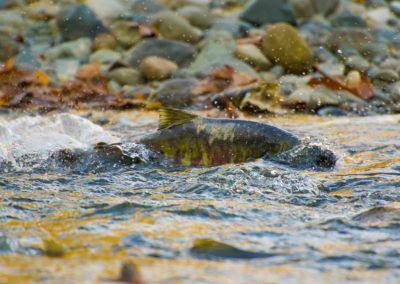 The annual return of Pacific salmon species to their natal rivers and decomposition of their post-spawning carcasses is critical to the functioning of coastal ecosystems. 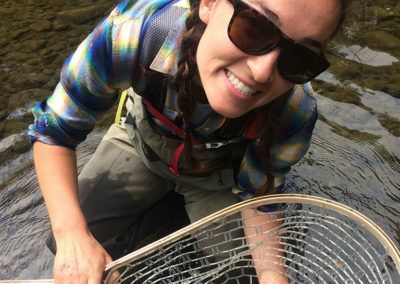 Marine-derived nutrients like carbon and nitrogen that accumulate in their bodies are transferred into rivers, which helps organisms from aquatic insects to juvenile salmon to even trees grow and survive. 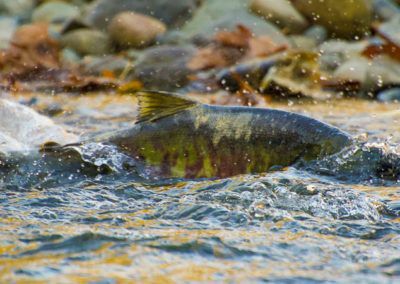 This large and complex nutrient cycle is important for keeping salmon watershed habitat intact for future generations of salmon that return to the rivers to spawn. Considering this context, our research examines the role that bald eagles play as nutrient vectors in transporting nutrients from rivers to forests. 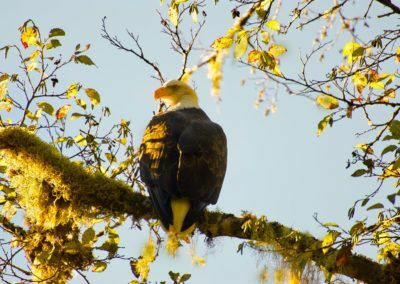 During the fall months, eagles that have spent the summer breeding season in northern latitudes migrate south along the BC coast, where they congregate on rivers to consume post-spawning salmon carcasses. Due to the large number of eagles that make this migration (often in the thousands), there is high competition over available carcasses. 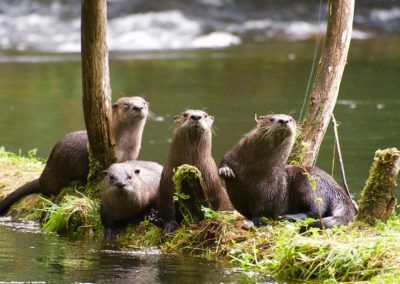 This competition often results in individuals stealing carcasses from others and flying their salmon to nearby perch trees, where they consume the carcass and drop the remnants onto the forest floor. The salmon bones and tissue decompose and are then incorporated into the forest ecosystem by insects and vegetation. 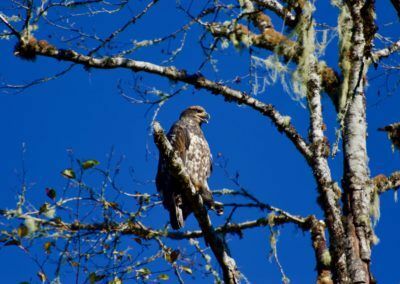 Our study aims to determine if this cross-ecosystem movement of nutrients facilitated by eagles is actively contributing to the productivity and biodiversity of forest ecosystems. 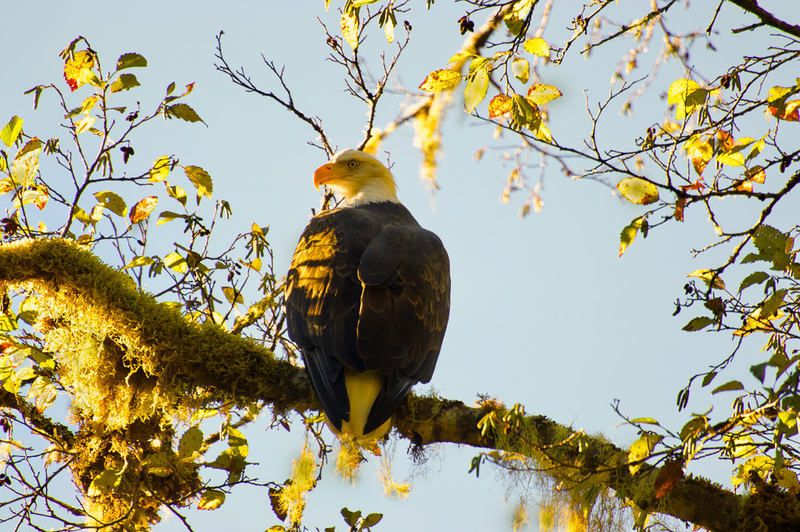 To determine this, we have collected data on eagle foraging behaviour and competition levels during the salmon spawning season, and have also taken invertebrate and vegetation samples to test for marine-derived carbon and nitrogen that is present under the eagle perch trees. 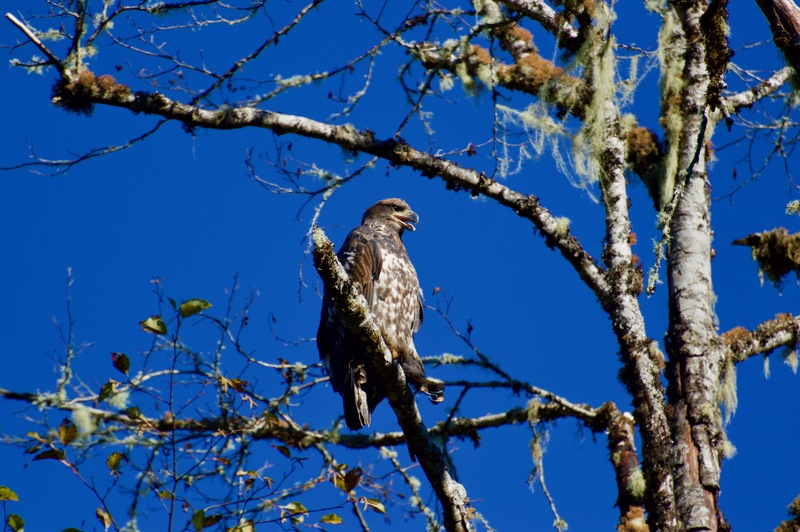 Once the analysis of this data is complete we will determine if the amount of nutrients that eagles contribute to the forest will change under declining salmon populations. 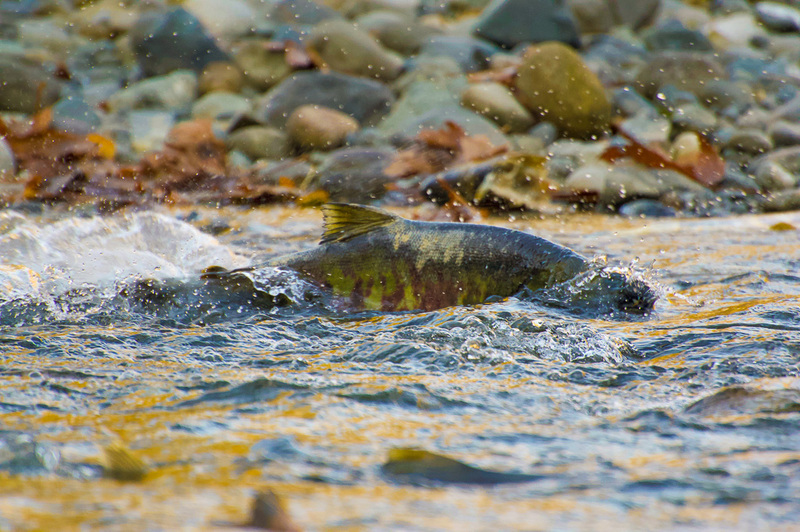 We will accomplish this by running a computer model that simulates a crash in salmon abundance and determines how a change in eagle foraging behaviour could affect the amount of nutrients going into the forest over the next 50 years. The consequences of this change could include alterations in food web dynamics and vegetation growth rates. 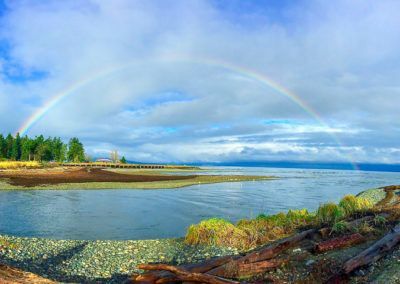 Ultimately, we aim to use the results of this research to inform ecosystem-based management strategies to ensure our coastal ecosystems remain resilient for the future.